1 his is a small, fierce falcon with fast (light and good hunting ability. It inhabits open places such as moorland, marshes, grassland, and low-lying coasts. The Merlin hunts in (light, often following an erratic course but always moving fast, and sprinting for the kill. It Hies low above the ground, using trees and ridges as cover. Birds in flight are its most common prey, but it also swoops down for animals such as mice. It also catches dragonflies in flight. • NEST A hollow made by the birds, often among heather. Old nests of larger birds, in trees or bushes, are sometimes used. • DlSTRIBl 'TION Breeds across much of North America and Eurasia. Winters as far south as n. South America, n. Africa, n. India, and S. Vietnam. Although as big as the largest and fiercest falcons, including the Peregrine (seep. 105), this species is a less aggressive hunter and seeks smaller, slower-moving prey. 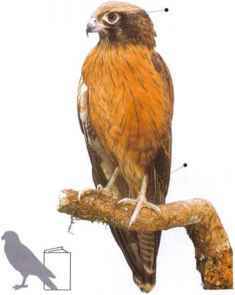 It also differs from the typical falcons in having longer legs and broader wings. The Brown Falcon occupies a range of habitats but favors open landscapes. When hunting, it sits and watches from a high vantage point for long periods, swooping to the ground to take small mammals, young or injured birds, reptiles, and insects. The call is a harsh, cackling sound. • NEST Old nests of other large birds, such as crows, arc-used. Brown Falcons sometimes nest on termite mounds. • DISTRIBUTION S. New Guinea and much of Australia. • REMARKS Females are larger than males. Color phases (seep. 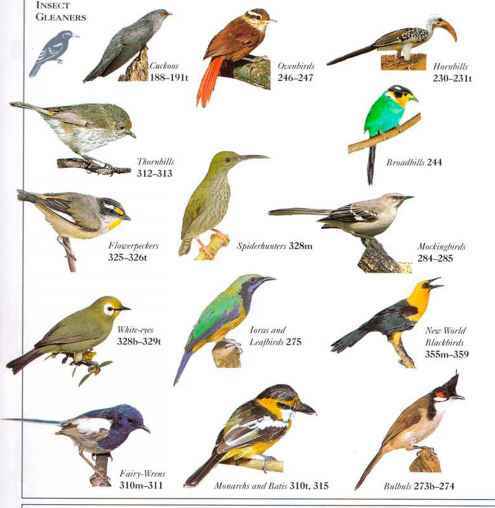 I.t) include light, rufous-breasted, and dark plumage.